With two children that can't yet walk, a double buggy is a part of our everyday life and Finn and Cora have been enjoying their new set of wheels. 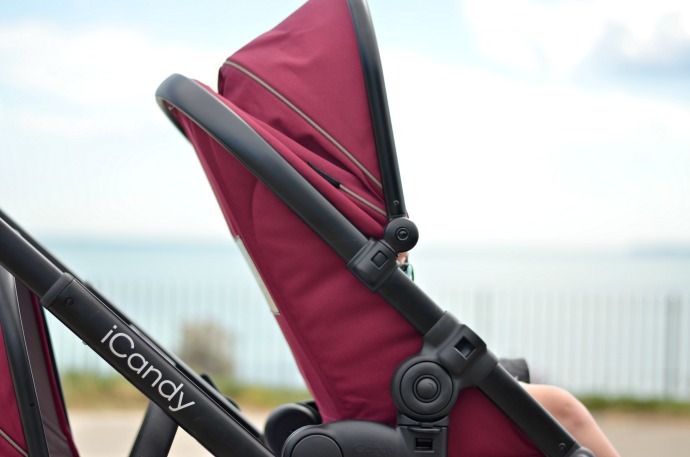 We bought our first iCandy pushchair when we were pregnant with Dylan over 5 years ago and they are a brand that we trust and love. 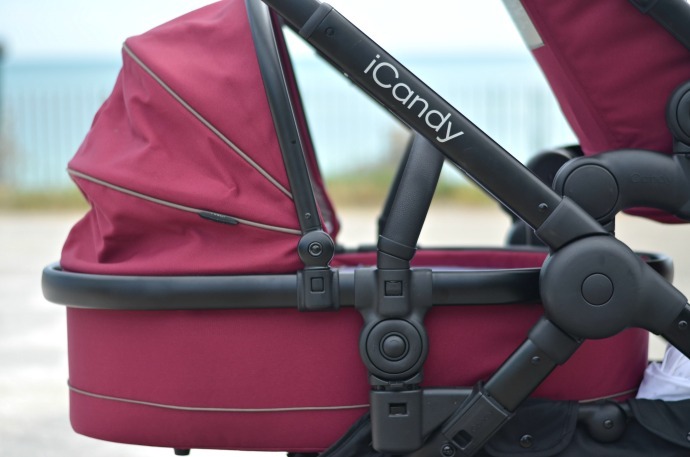 The iCandy Peach Blossom is a versatile double travel system which I have found comfortable for both children, easy to push and ideal for getting around. 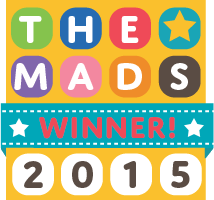 This pushchair can be used for two newborns, two toddlers or a newborn and toddler. Both positions can be used with a carrycot, car seat or child seat although so far we have only used it in the combo shown in these pictures. 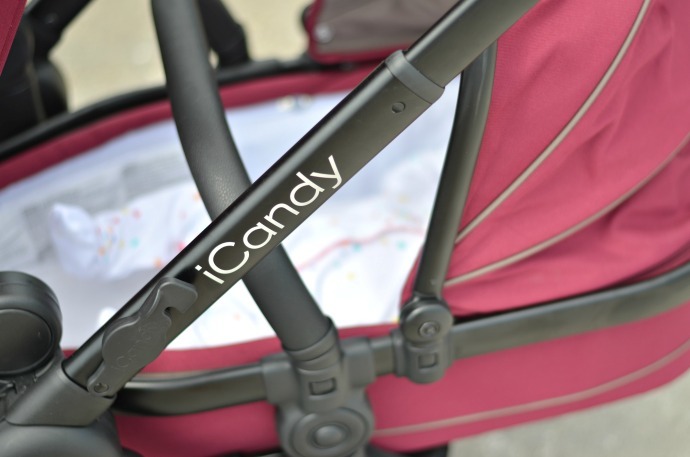 Cora has a carrycot on the bottom and unlike the apple2pear this one is rigid. It feels and looks secure and snug and is easy to attach and remove. 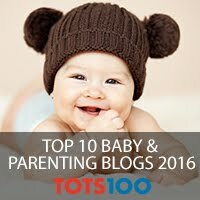 The carrycot, like with most double buggies, is relatively small but Cora fits perfectly and still has growing room in all directions. It is suitable for overnight sleeping and we often use it for daytime naps if she lets me put her down. Finn sits up top at the moment and as a large 17 month old he still has plenty of space. The straps are easy to adjust and do up and he loves his new ride. The seat can be reclined easily and Finn has no problem falling asleep in there. In this mode, the seats both face outwards, but when we change to two seats we can have them both facing in, with the top seat closer to me. I do miss having Finn facing me and that is one of the only changes I would make to the peach blossom. The peach is easy to fold, but both seats and the adaptors need to be removed first. It doesn't take long and everything slots back in to place very easily. The chassis has a long strap so that it can be carried over one shoulder and that has been brilliant when taking it out and into the car. The black chassis really stands out and I love the colours of this pushchair. I chose it knowing I would be using it for both a boy and girl and I love pushing it. We are finding that the black frame scratches more than our others but with four small children to hustle out the door each morning it may be the way we treat things. 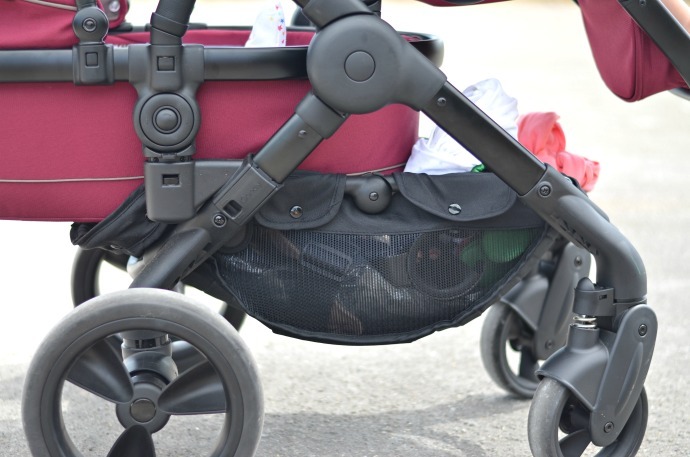 This pushchair can also be used as a single and I have loved taking it out with just one baby in it as well. In double mode with a carrycot the basket size is limited ( but still able to fit in two raincovers, two blankets and jumpers for all four children) but in single mode the basket is huge and perfect for shopping! I love pushing the peach and can do so one handed with no problems. Curbs are easy to manoever and it is much lighter than I expected considering there are two children in there. We have the seat unit ready for when Cora is sitting up so I will update this post when we have given it a good go with two full size seats. 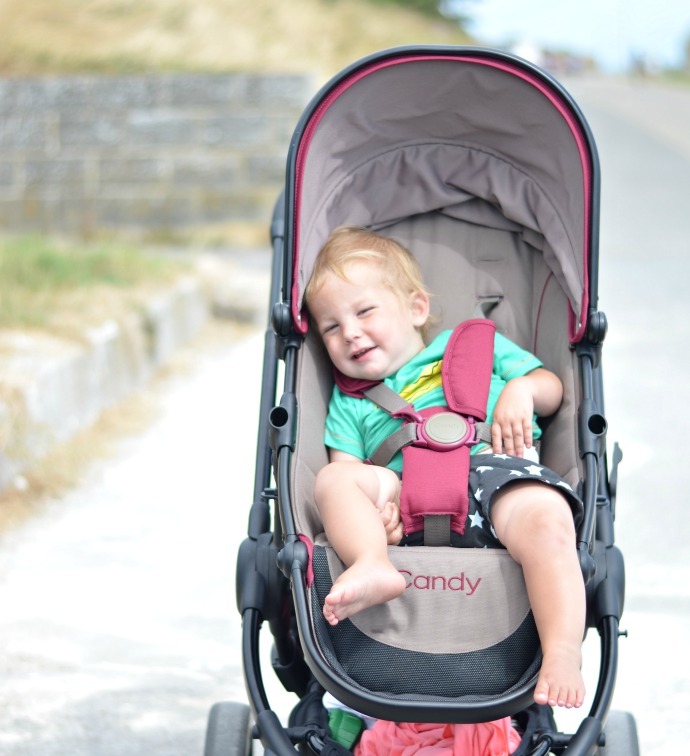 I love this pushchair and it fits our needs perfectly at the moment. 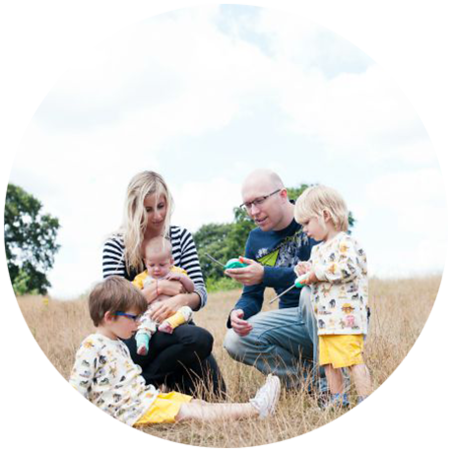 Both children are comfortable and secure and I love the way it feels to push. This buggy looks great and we have so many compliments. 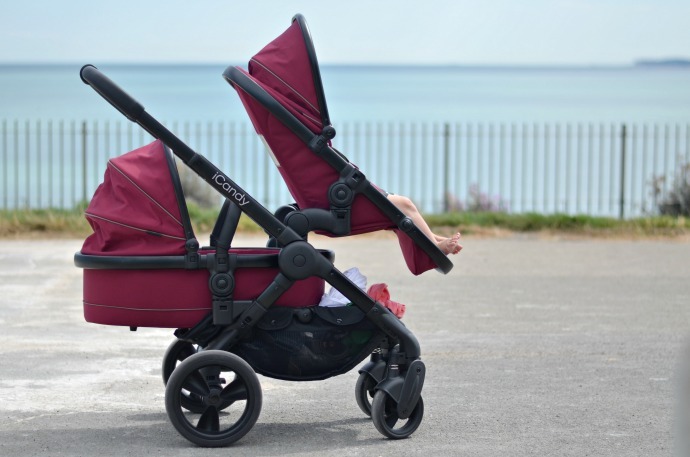 The Peach Blossom is currently £955 for the main components, and then an extra £172.50 for the carrycot. There are lots of other co-ordinated accessories you can buy from footmuffs to travel bags to cup holders.